A 29-year-old man and his fiancée were among those killed last week in a fiery bus crash on a California freeway, according to KTLA 5. The incident occurred when a bus carrying dozens of California high school seniors was struck by a FedEx tractor trailer about 100 miles north of Sacramento on Thursday night, authorities said, the news station reports. Among the 10 people killed was Michael Myvett, who worked with autistic children. 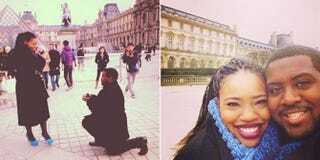 He had proposed to Mattison Haywood, a chaperone aboard the bus, last December during a romantic trip to Paris. “He was beloved by his friends, family, supervisors and co-workers. He was very bubbly and positive,” a statement from the Center for Autism and Related Disorders in Torrance, Calif., says. Myvett asked Haywood to wear blue heels when he proposed outside the Louvre in Paris late last year. He loved the shoes and wanted them preserved forever in images from their big day, CNN reports. “She had no idea that I was going to ask her," he posted on Facebook at the time, CNN writes. "She was mad at me cause I wanted her to wear those shoes and her feet were hurting. I remember her saying, 'omg are you serious'?" But as Haywood tottered in the heels, Myvett kneeled and put a diamond on her finger. "He was a father figure to both of his brothers," said his cousin, Trinice Sampson. The family was notified of the deaths of both Myvett and Haywood, Sampson told CNN. Read more at KTLA 5 and CNN.